• Research, analyse and synthesize information into accurate answers or actionable information and ensure that customers have the tools or capabilities to apply them. • First level degree in library or information science, communication or closely related field is required. An advanced degree would be an advantage. • At least 5 years of experience in information services and communications with increasing responsibilities. • Experience in a multicultural environment desirable. • Knowledge of trends and issues and experience in the use of web tools and technologies including electronic reference services. • Experience in nuclear science and technology would be an advantage. 9/28/15 – For anyone interested in International Librarianship, IFLA is the United Nations of libraries. IFLA, which stands for The International Federation of Library Associations and Institutions, is the ‘global voice’ of the library and information profession worldwide. The organization was founded in 1927, currently has over 1500 Members in approximately 150 countries around the world, and is headquartered at The Royal Library, the national library of the Netherlands, in The Hague. To be honest, I have followed IFLA’s activities for many years but not participated partly because they were very ‘white-paper’ based and partly because of the expense of traveling to their conferences. However, in recent years I have noted they are becoming much more hands-on and I they are collaborating more with organizations such as ALA. For example here is here is the latest news supplement. FYI: They also maintain a very useful international jobs list (LIBJOBS). Offered two times: October 5th @ 6:00 pm PDT / October 7th @ 7:30 am PDT. Register by: September 30th. We are excited to invite you to a special webinar featuring our Founder, John Wood, sharing details from his recent trip to Nepal. As you know, the earthquakes that struck earlier this year devastated much of the country’s infrastructure, including its schools. The Nepalese people have started the long, hard road to recovery, but in many regions—especially in the poorer, remote areas where Room to Read works—communities lack the means to rebuild on their own. During John’s trip, he met individuals throughout Nepal who are eager to overcome these challenges. He spoke with Girls’ Education Program participants who lost their homes, parents who hope to see their communities thrive, and the President of Nepal, Ram Baran Yadav, who wants to see Room to Read’s education model implemented throughout the country. Join this webinar to hear John’s first-hand account of our plans to help rebuild safe, effective learning environments in Nepal. 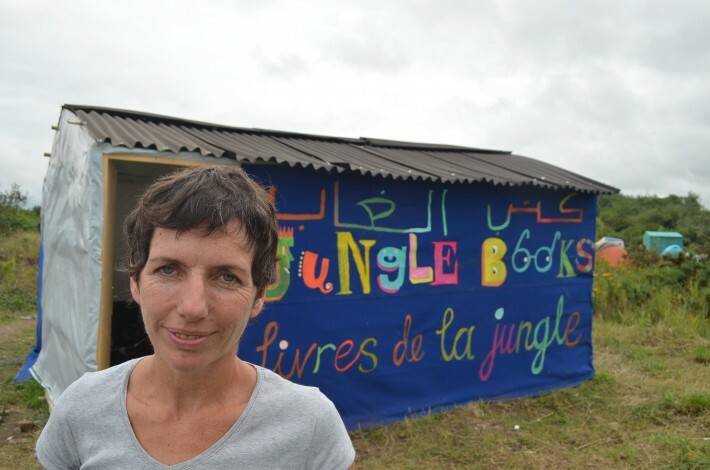 Jungle Books: Calais migrant camp’s newly opened library needs books! Verso is sending a selection of English-language titles including John Berger’s A Seventh Man, Hsiao-Hung Pai’s Scattered Sand, Jeremy Harding’s Border Vigils, our graphic novels, as well as foreign editions of our books in several languages. To contact Jungle Books directly, email Mary Jones at maryjones@orange.fr. Shape the future of higher education at one of the nation’s fastest-growing and most dynamic private, nonprofit universities. Help drive student success in a unique culture of innovation that values teamwork, openness and diversity. Enjoy a highly competitive benefits package from an organization ranked a Best College to Work For eight years in a row by The Chronicle of Higher Education. The Shapiro Library at Southern New Hampshire University seeks an engaged, service-oriented Reference Librarian who welcomes the opportunity to offer services that meet the learning needs of SNHU students, faculty, and staff. Reporting to the Head of Reference, the Librarian works as a member of a collaborative staff providing prompt, courteous and supportive virtual reference service to all library users seeking information via an electronic means; such as email, chat, VoIP (voice over IP such as Google Voice) and through videoconferencing. Staffing the virtual reference desk, the librarian will assist users with research, utilizing library tools and resources, and suggest materials for further study. This individual will also assist users with general inquires of citation styles, technology and University information as needed. The Librarian may also work with individual students on a scheduled appointment basis over the phone and/or through videoconferencing. Other projects as assigned can include: creating subject and course guides, video tutorials, etc. This individual will work selected reference shifts during the academic year (late August-mid December and January – early May) depending on reference desk needs. There may be a possibility of summer hours. Shift hours may change due to schedule needs, as appropriate. Sarah P’s comments: ISK has been known as a good, long-established school in an interesting region however has had some troubles in recent years due to increased unrest in the country as well as a reportedly difficult administration. Apparently, things are now getting better in both areas however if you are interested in applying I would recommend reading the reviews on International School Reviews first. FYI: The position is to begin the 2016-17 school year. The Middle/High School (Secondary) Librarian shares responsibility for the daily operation and supervision of the library and implementation of all prog rams and services necessary to allow students and faculty to maximize use of the facility and its resources, particularly the middle/high school divisions. Performance will be evaluated annually by the High School or Middle School Principal and according to the ISK appraisal system, including the ISK Librarian Growth and Appraisal Rubric. The Middle/High School librarian may teach one section of the Scholarly Research and Writing Course and will support students and teachers in the Extended Essay. Additionally, the librarian will be expected to participate in a variety of collaborative teams and committees; fulfil supervision duties as assigned, including some evening and weekend events (as well as off-campus trips); possibly serve as advisor to a small group of students; and contribute to the co-curricular program. 8/13/15 – This is a position which pops up every 2-3 years. For those interested in the South Pacific/Oceania region it should be of interest. They offer accommodation on a compound and the salary and benefits are good for the region. I once interviewed with them and they were very nice to chat with and asked some interesting questions mostly on the theme of ‘making do’. Then they contacted my references however nothing materialized after that. I have had two colleagues apply with one having the same experience and the other hearing nothing. So not sure how organized they are with the hiring process. The Papua New Guinea University of Technology is located in the industrial city of Lae, the second largest city in Papua New Guinea with population of over 100,000. The city is accessible by air from any part of the world. The University is the only technological university in Papua New Guinea. It has a main campus and three amalgamated colleges. The main campus has 14 academic departments including one in Open and Distance Learning (ODL). It offers undergraduate and graduate programs in engineering, natural and applied sciences, built environment, language and business. The university has also an Information Technology Services department and a Library. Applications are invited for the following positions. For more information go to: www.unitech.ac.pg. Matheson Library, named after the first Chancellor of the University, was founded in 1967. It has a current book stock of 130,000 volumes and receives 600 periodical titles. It is the only library in the university serving some 250 academic staff and 3,000 full time students taking a range of degree, diploma and certificate courses in Civil, Electrical, Mechanical, Mining, Communication Engineering, Business Studies, Architecture and Building, Surveying and Land Studies, Mathematics and Computer Sciences, Applied Sciences, Applied Physics, Forestry, Agriculture and Communication and Land Studies. The Library system is automated and it operates 7 days a week with limited operation during weekends. The library seeks to appoint a University Librarian to immediately fill the vacancy. The University Librarian is responsible for the overall management and development of library services, collections, budget and staff. The University is concerned that it gains access to the information superhighway and its new Librarian will be expected to continue this process. Applicants should have a first degree and an internationally recognized professional qualification in librarianship. Candidates must, at minimum possess an MLS. In addition, the successful candidate must have experience working in academic or research libraries and operational concepts involved in the delivery of users and bibliographic services and library automation. The appointee must be able to manage emerging trends in academic libraries especially those resulting from electronic access to information. The appointee should have excellent written and verbal communication skills, business skills and good interpersonal skills. Initial contract period is normally for three years. Other benefits include a gratuity of 30% of salary in the first year, 35% in the second year and 40% in the third year (paid on fortnightly basis), support for approved research, appointment and repatriation fares for yourself and dependants, book & equipment allowance of K750.00 per annum, settling-in/out allowance of K1,700.00 for single & K3,600.00 for accompanied plus K200.00 each for two authorized dependent child (under 19 yrs) on appointment and repatriation, six weeks paid leave per year, recreation leave fares for yourself, spouse & two authorised dependants after 18 months of service, education fares and assistance towards school fees for authorised dependants are available. Staff members are also permitted to earn from consultancy up to 50% of earnings annually. Free fully furnished accommodation provided on campus. Detailed application with curriculum vitae including certified copies of qualifications, names and addresses including email addresses, fax/phone numbers of three (3) referees including one from past/present employer, if any, and an indication of the earliest availability to take up the appointment should be received by: The Registrar, PNG University of Technology, Private Mail Bag, Lae, Papua New Guinea by 30 September 2015. Applications may also be sent by email through: nlaena@admin.unitech.ac.pg and fkobal@admin.unitech.ac.pg. This advertisement and further information on these positions can be found at www.unitech.ac.pg.